You want to leave an impression of real magic in the minds of your audience? 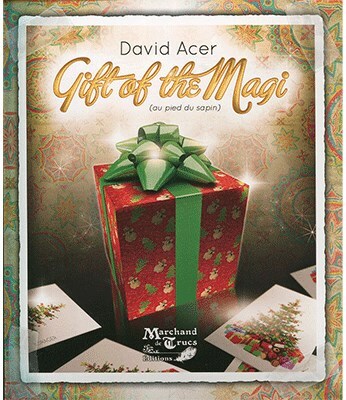 Effect:The magician has a card on the back of a colorful Christmas tree. The only problem is that there are no gifts under the tree. So the magician asks the spectator to write his initials on the star atop the Christmas tree before covering the card with his hand. The magician asks him to return the card and now reveals a profusion of printed gifts under the tree. Of course you can leave the card as a souvenir. This effect can be presented for adults or children, a version for children is explained in the booklet with a final where you appear a gift and pull a coin that you offer to the child at the end of the routine. Very detailed leaflet in French and English layout by Benoit Drager and illustrated by Tony Dunn.